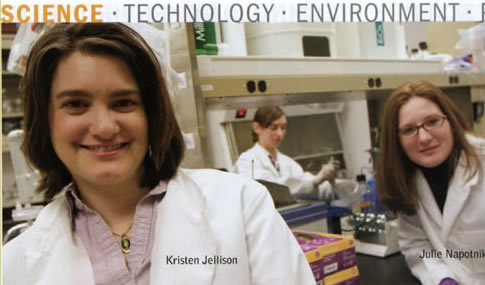 Kristen Jellison, assistant professor of civil and environmental engineering and STEPS faculty member, with students. Lehigh faculty and students are working for environmental change with many groups outside the University. STEPS faculty members Kristen Jellison, Alec Bodzin, Steve Peters, and their students have all worked on the Palmerton Superfund Site in coordination with the Lehigh Gap Nature Center. Journalism professor and STEPS faculty member Sharon Friedman has used her knowledge of the Three Mile Island meltdown to inform her work on environmental reporting worldwide. Outside of Lehigh, the Wildlands Conservancy has worked with Earth and Environmental Science faculty and students to monitor the water quality of the Lehigh River. Many people from Lehigh are interested in the conversion of the old Bethlehem Steel factory, and the adaptation of old rail lines into a greenway, led by the City of Bethlehem.